Will a Bad Night's Sleep Before a Race Affect Performance? Will a Bad Night's Sleep Before a Race Affect Performance? Runners Connect » » Training Articles Will a Bad Night’s Sleep Before a Race Affect Performance? Will a Bad Night’s Sleep Before a Race Affect Performance? It was my first conference championship in cross country, arguably the most important team event in college running, and I was a nervous wreck. As a freshman, I was being counted on for a great run. I had never experienced pressure like that before. The night before the race I tossed and turned in my bed, fretting about my fitness, and hoping that I had a good day ahead of me. What few minutes I did “sleep” I had the all-too-familiar runner’s nightmare of running helplessly through mud while everyone else seemed to glide along. All told, I got maybe an hour of sleep that night. I was a little skeptical. That advice seemed like an old wives’ tale. But then he told me the story of how he qualified for the Olympics as a college Junior, running a personal best in both the preliminary and final round of the steeplechase, all without sleeping a wink the night before the race. That convinced me I was going to have a great performance, and I immediately put my sleepless night behind me and ran great that day. That’s the advantage many runners who competed in high school and college have. We can lean on the stories of our teammates and coaches to give us confidence when things don’t go as planned. I don’t know you or your college coach. How is a simple story supposed to give me confidence if I have a bad night of pre-race sleep? That’s why we’re going to look at some of the research on sleep and performance, to demonstrate how science has proven the idea that the night of sleep before a race doesn’t matter, why we feel like it does, and how to combat it. Are you sure a lack of sleep won’t affect me physiologically? 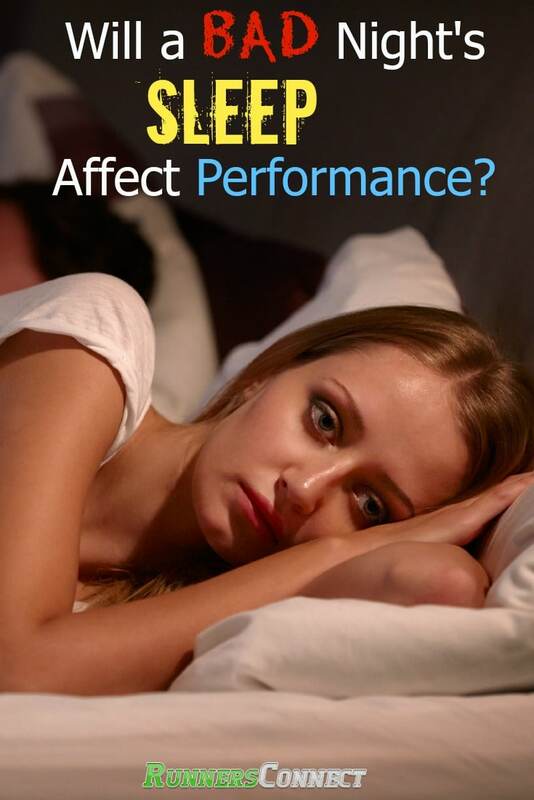 A 2007 review paper by Thomas Reilly and Ben Edwards at the Research Institute for Sport and Exercise Sciences sifted through a variety of studies on the impact of sleep and performance. The data they collected from a myriad of studies suggest that while mental cognition was lessened, physiological markers of endurance performance were surprisingly stable – even after a few days worth of poor sleep. Reilly and Edwards were able to demonstrate that leg strength, fatigue resistance, and oxygen demand at various speeds on a treadmill were all unaffected by one night of poor sleep. While raw physiological data is the backbone of exercise science, it sometimes doesn’t translate to race day performance. In the end, what every runner should be most concerned about is whether these findings are going to have a measurable impact on their actual performance. Turns out data supports this as well. In one study, Dutch researchers had 10 men do all-out 20-minute cycling time trials. The control group was allowed to sleep as normal while the other group arrived at the research lab at 11 p.m., and were not allowed to sleep until they had completed the time trial at 1 p.m. the following afternoon. The control group covered an average of 7.68 kilometers during their 20-minute cycling time trial. Surprisingly, the no sleep group performed almost exactly the same: they covered an average of 7.62 kilometers, and physiological measurements, including average heart rate, were also nearly identical. Why does it feel harder on no sleep? Now that we can emphatically show that not sleeping the night before a race has no impact on performance, we need to address the problem of why it feels so bad and what we can do about it. Reilly and Edwards’ review noted that subjects rated their perceived efforts higher when sleep-deprived. Reilly and Edwards suggest that this may be because the brain and the nervous system are the biological structures that need sleep the most: while your heart, lungs, and legs are ready to go at full-tilt even when sleep deprived, your brain and its neural system are sluggish and tired. This is demonstrated quite nicely in the above mentioned study on Dutch cyclists. The researchers also had both groups estimate how far they had ridden during their time trial. The control group guessed, 7.26 kilometers, pretty close to their actual output. However, the sleepless group estimated only 6.51 kilometers – almost a full kilometer short. After a poor night of sleep, it’s likely you’ll be very unmotivated and cognitively feel like you’re not able to perform your best. In training, this might lead to you skipping workouts for fear of them not going well. In a race situation, this likely leads to increased nervousness or results negative thinking, which can be detrimental to performance. Utilize this research, bolstered by a few stories of successful runners who have performed well on no sleep, to stay positive on race day should you have a bad night’s sleep or have to wake up extremely early to get to the start line on time.